I've had a Groupon deal for a Sydney tall ship ride burning a hole in my inbox for a while now, so we headed up to the city for a belated Father's Day weekend (they celebrate Father's Day at the beginning of September here). I could wander the city for days, but stamina for that sort of thing with my other family members is fairly limited. Alas, here is where Traveling With Children Tip #142 comes in: Taking the train, and hence having to walk from the train station to a destination, is the perfect way to squeeze in some wandering without it being discussed (and vehemently shot down) as an official trip itinerary item. As in Denver, I appreciate the older architecture the most, and Sydney has a similar blend of the lovely old against the new, sleek and modern. I had noticed Haigh's Chocolates before because of the green tones in the glass, but let's be honest--they had me at 'chocolates'. We managed to keep it to the singular and selected a piece each. Kenyon, whose favorite color is pink, chose a rose cream decorated with a small pink rose on top. The Strand Arcade is a breathtakingly beautiful historic shopping area that we happened upon for coffee, and the man working at Strand Hatters was kind enough to allow the boys to try on a few hats. There's something about hats that transports you to a whole different persona the minute you put one on. Alex's seasonal allergy-ridden eyes and this hat are not a good match, but I do love the way he felt the need to grip the suitcase handle as if he were bound for a distant land. This hardworking, scrappy little newsboy would likely lead a double life as a pickpocket. His pickpocketing earnings allowed him to take an early retirement, so he picked up and moved to Moscow. Sam fell for this hat and I thought he looked quite dashing, but he wasn't sure he would use it enough to justify its cost. I should have just bought it. 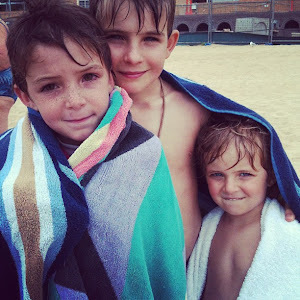 Since our first trip to Sydney, we'd promised the boys that we'd return to the Darling Harbour water playground, so as soon as we dropped our bag off at the Sydney Harbour YHA the boys were off like a herd of elephants stampeding to a water hole after a drought. Despite the absolutely perfect weather, the park was mercifully less crowded than the sardine can experience we had on our first visit here. I still broke out my stern, kill-all-the-fun mom voice that should any of them wander out of eyesight for even a moment, our water park experience would be OVER (yep, I even turned on the echo for the full effect). My threat worked; Sam and I had no problem keeping an eye on them and enjoyed watching them frolic. Although we weren't sitting near each other, Sam and I independently came up with names for this popular move: Sam dubbed it 'The Enema', while I opted for 'The Bidet'. They had enough fun to put up a decent protest when it was time to leave, but we had to get them changed and to the harbour for our tall ship cruise. Tickets for this hour and a half experience are usually $50 each, but it's always listed on some daily coupon site and I scored them for $19. Live music, some nibbles to munch on, and a glass of champagne paired wonderfully with the blue skies and beautiful Sydney views. Sam and Jackson signed up for the mast climb, something the younger two boys wanted to do but weren't big enough for the safety harness. Me? I have no interest in climbing to the top of a tall, teetering pole thankyouverymuch, I'll just stay here and guzzle sip my champagne. I blinked, and suddenly Jackson was very high. And at that moment, I heard Sam's voice saying, "I don't think I'm going to go any higher than where I am right now." He persevered, and made it to the mast lookout with Jackson. Later, he'd say that he wished he'd looked around a little bit more because he just had tunnel vision. Jackson was a champ, but did say he was more nervous on the platform than he had been on the climb. What kids wouldn't want their hand at steering a massive pirate ship? We also took advantage of another opportunity to take some photos by the Harbour Bridge and Opera House. The kids don't seem to particularly care about that sort of thing now, but I figure they'll think it's neat to have them someday. When I look at this picture, it seems like I am looking into a crystal ball ten years in the future. Why does Jackson look like he's 19 here instead of 9? For some reason, this one of Alex evokes an early Beastie Boys, No Sleep Till Brooklyn kinda vibe. This image is very postcardy, but man, this is a pretty city...I'm smitten.